Note: You can enter this giveaway one (1) time per e-mail address per day. Deadline is 11:59PM ET 4.10.19. Cool, crisp falls have us thinking of flaky apple pies and pumpkin spices; cold winter days have us longing for hot chocolates and slowly cooked meats; on bright, spring days fresh greens and vibrant salads, then leaning into lazy hot summer days with cold drinks in hand and seared meats on the bbq. 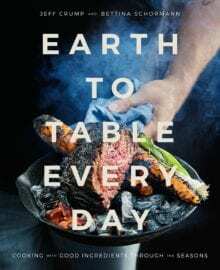 Jeff and Bettina, co-founders of Earth to Table: Bread Board restaurants in Hamilton and Guelph, Ontario, and Earth to Table Farm share a collection of 140 recipes that highlight the bounty of every season. And because we’re all about everything fall right now some snappy, spicy slightly sweetened roasted parsnips are what should be on your plate. You can thank us later. NO PURCHASE NECESSARY TO ENTER OR WIN. Void where prohibited by law. Open to legal residents of the 50 U.S., D.C. and Canada (excluding Quebec) who are at least eighteen years old at the time of entry and have internet access. Begins on 3.20.19 at 12:00 a.m. ET and ends on 4.10.19 at 11:59 p.m. ET. To enter this giveaway, submit your full name and email address on this form. Odds of winning this giveaway depend on the total number of eligible entries received. Only one (1) entry per email address per day. Sponsored by Leite’s Culinaria, Inc. For more information, visit our Official Rules. For a list of winners, check out our Very Happy Winners page. Be sure to add giveaways@leitesculinaria.com to ensure notification if you are the winner.